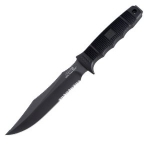 The knife is good, but, the sheath that came with this knife that has hibben stamped on the button is so cheap it literally tears like paper. Carried it 1 time and now I've got to have a new sheath made. Im a practical guy and when it comes to my knife i do want a good knife and i had my a.s.k. for a couple of yrs. and i hunt, fish, camp and scout.and for what I use and need it for I never had problem with it. 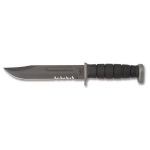 This knife is designed by Gil Hibben and made by United Cutlery. Hibben is known for his custom knifes/swords. This is very heavy knife compared to it's size. Lenght of the knife is 317mm (12 1/2") and it weighs about 500g (17.6 oz). Blade is made of 420 steel with a curvy model, it's full tang and roughly 5mm (1/5"). There's one finger groove on the blade right after the finger guard so you can get more balanced hold for finer whittling. Handle is made of micarta and has really deep finger grooves which has rather pointy heads. The finger guard is quite fancy, tho I wonder how it survives possible drops or slight misabuse. I have always liked this kind of blade (have it on my old Tailwind Pro -folding knife). This kind of blade curve gives you more precise and balanced way to work with wood. I have find it to strain my wrist a whole lot less than knives with straight edge line. For that little money you get a REALLY good knife. Just remember it is heavy even compared to larger knives.